Memorial Field is a peaceful place in the heart of downtown Issaquah. Come on a sunny day to enjoy the ball fields, playground, good views of the surrounding green hills. The piece of land that is now Memorial Field was once owned by the Superior Coal Company. Superior Coal, a German-owned company, purchased the plot in 1913. When World War I began, their claim to the property was no longer recognized. The family who owned the field prior to its sale to Superior Coal was not able to reclaim ownership due to a tangle of mortgages and sales agreements. The field sat, neatly fenced and unused, in the middle of town. By 1918 it was a cutover woodlot. Issaquah’s ball team (who also happened to be the volunteer firemen) had their eye on the field, as it was tough to find a place to play ball that was not liable to snapped up for use as a homestead site or livestock pasture. They decided to take on the challenge of purchasing the field and clearing it of stumps, which involved fundraising and a lot of manual labor. The purchase of this field was a real community endeavor; most of the necessary funds were donated by coal miners, many of whom donated a full day’s pay to the venture. In the end, the firemen had enough additional capital to purchase an adjoining piece of land to be used for a new city hall. In 1930, City Hall was moved from the old Gilman Town Hall into a building on this site (today the site of the Police Station). Memorial Field was also the home of the Issaquah Rodeo. In the early 1920’s a group of Issaquah businessmen promoted rodeos, held at first on the Fourth of July and late on Labor Day as well. Each rodeo kicked off with a parade through town; a photo of one such parade shows few riders and onlookers, indicating that the rodeo may not have been an event of great interest. 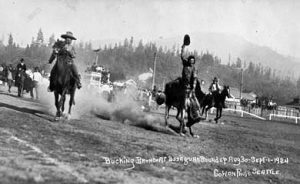 While lack of interest among the citizens may have contributed to the end of the annual rodeos, photographs of rodeo riders in the midst of the action convey the thrill and excitement of the sport; a number of captivating Issaquah Rodeo photos are preserved at the Gilman Town Hall Museum. 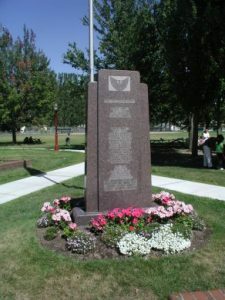 This war memorial was dedicated on September 5, 1949. It was originally located about where the main steps go up to the new police station, and was later moved to its current location near the library. The memorial honors local residents who gave their lives in the 20th century’s major wars. Today Memorial Field is a public park administered by the City of Issaquah.